Call 803-426-9933 to schedule your first appointment. Do you think you're one of the 36 million people in America with some degree of hearing loss*? If so, turn to the hearing care specialists at Miracle-Ear®. We serve the residents of Columbia and State park. We can give you a free hearing test** to assess your abilities before presenting you with hearing aids that meet your needs. We'll make sure they are programmed to your specifications and fit you securely so that you don't have to worry about anything but getting the most out of your activities. A main reason why we're America's most recognized brand of hearing aids is because we've developed hearing aids that use cutting-edge features and are easy and convenient to use. Our GENIUS™ Technology includes High-Definition Digital Sound, Wireless Windscreen, and VoiceTarget 360, allowing them to be effective at filtering out background noise and enhancing the sounds that are important for you to hear. Many of our customers have reported that they often forget they're wearing hearing aids because they're so comfortable and natural-feeling. Miracle-Ear® hearing aids are easy to maintain, and the hearing care specialists at our hearing aid center can even clean them and repair them for you, free of charge, during one of your follow-up appointments. Our products come with a 30-day risk-free trial† so there's no reason why you can't give our hearing aids a try. If you've been searching for hearing aids in Columbia, SC, look no further than Miracle-Ear. Come visit us to discover and experience the Miracle-Ear advantage. I have an Associate�s Degree in Health Care Administration and have many years of experience in the medical field. I am licensed in South Carolina as a Hearing Instrument Specialist. 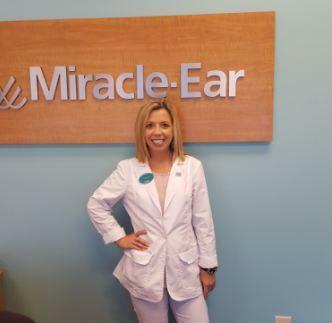 My favorite part of working for Miracle-Ear is building life-long relationships with my patients and assisting those with all levels of hearing loss. I love being able to use my knowledge to not only improve my patients hearing, but also improve their quality of life. Nothing brings me more joy than to help someone hear again, and to help them better communicate with their loved ones. "I cannot begin to tell you what a difference Miracle Ear has made in my life. I was to the point that I could not carry on a conversation in a noisy room or restaurant, could not hear people speaking over the phone, constantly saying “what did you say” or nodding my head like I understood what was said. A friend recommended Miracle Ear to me. I went in, had a hearing test and talked with someone about the options. They were not pushy and they explained everything to me. With their guidance, I chose the best option for myself. They did not try to sell me the most expensive product. I love my hearing aids. What a difference it makes. I wish I had not waited as long as I did to get my hearing checked. I used the Miracle Ear office on Garners Ferry/Patterson Road and everyone there has been extremely helpful. I would highly recommend them to anyone that is having hearing problems. They are so helpful and I never have to wait for my appointments." "I am very very happy with my Genius link hearing aids. They are, hands down, the best I have worn. They have made a huge, positive, change in my life ! I found them quite easy to use thanks to Nancy's expert counseling and the excellent technology of these aids, I am wowed with the bluetooth capabilities and the phone/tablet app. I love this feature! Thanks for convincing me to get the Genius link!"